This cocktail ring is smartly unique in cut, color and style. This blend of sterling silver with antique-square cut quartz and diamonds produces a stunning display that captivates the attention anytime. Completely round shape fashioned from 925 sterling silver and lined with diamonds in the upper half all the way to the 8mm x 8mm base sitting at its top. The base is made of sterling silver and holds the 2.60 Carat smokey quartz gemstone in place while acting as a base for the halo of diamonds surrounding it, each one 0.11 Carats, same as the ones lining the upper half of the ring. In all, this smokey quartz cocktail ring has 36 diamonds embedded. 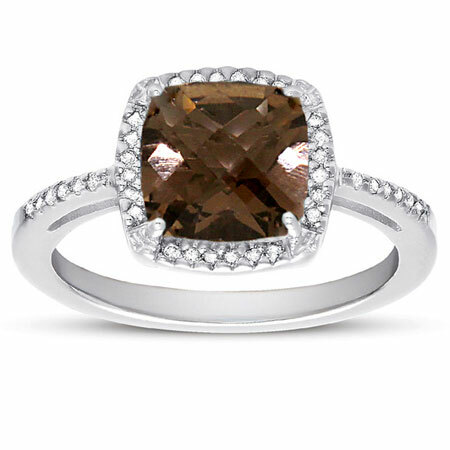 We guarantee our 2.60 Carat Antique-Square Cut Smoky Quartz and Diamond Halo Cocktail Ring in Sterling Silver to be high quality, authentic jewelry, as described above.